Learning How To Use Lemongrass will open the door to the foods of Southern Asia and India. This herb has a subtle citrus flavour that is unique. Fresh lemongrass is no longer difficult to find but you can buy it frozen or dried so there is no reason not to try it. Sure, fresh is always better, I’m not going to argue with that. But if you’re passing over recipes with lemongrass because you haven’t seen it or don’t know how to use it then this is the basics you need to know for cooking. Older recipes may list lemon zest as a substitute but there would usually be a footnote saying there really is no substitute for lemongrass. This grassy herb is used to flavour soups and stews, curries and stir-fries, marinades, salad dressings and tea. You just have to try it to know the unique taste. 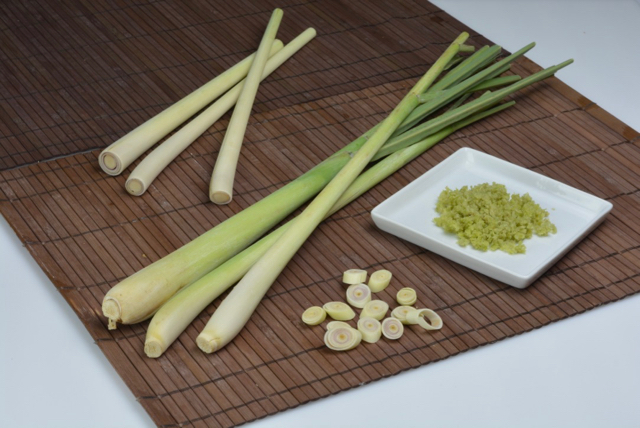 The fresh long stalks of lemongrass are sometimes sold loose but more often are bunched together like green onions. More recently I see them in the produce section, already trimmed and packaged on a small tray covered with plastic wrap. It can be found in Asian grocery stores but also large grocery store chains, especially those with an extensive Asian section. If you buy more lemongrass than you needed just freeze the leftovers. Whole stalks will be somewhat limp when thawed but can be used to flavour soups and curries. I buy fresh lemongrass stalks for special occasions or when I want the whole stalks for a specific recipe (like my Pork and Shrimp on Lemongrass Skewers). Otherwise I prefer the convenience of frozen for everyday cooking. In the freezer section of Asian markets you can find frozen, chopped lemongrass. Sold in little plastic tubs or packages, it is convenient for the everyday home cook. Lemongrass can be difficult to cut so requires a sharp knife and some decent knife skills. In the freezer it can be untouched for months and yet when I want to make a recipe calling for lemongrass I have it in on hand. But, and there is always a but…frozen lemongrass has an ingredient list. The frozen lemongrass I bought lists ‘blue number one and yellow number five artificial colours’. I think adding artificial colour is unnecessary and it annoys me. Although I now have a six month supply I may just cut up fresh lemongrass next time I need some and freeze it myself. Dried lemongrass can be bought as whole or cut stalks, coarsely chopped and sliced similar to dried chives or as a powder. Years ago I kept dried lemongrass in my spice cupboard but with fresh and frozen readily available I don’t bother with it any more. Dried lemongrass will still impart its’ unique citrus flavour. To use fresh lemongrass stalks you need to trim both ends. First cut off the top one-third of the stalk. Next trim the bottom root end cutting about one-inch off. Next pull off the toughest outer pieces from the stalk, two or three pieces depending how thick the stalk is. Now you have the most tender part of the stalk to chop or slice depending on the recipe. You can even use them whole as skewers. Don’t worry about whether you did it right, just try it. If you didn’t pull off enough from the stalk or trim off enough of the root there may be chewy bits in your dish. Sometimes you can tell they are too woody because they are really hard to chop. Learn as you go. All of the stalks and end pieces can be used to flavour soups and curries or simply discarded. (You can freeze them for this purpose too.) Some recipes instruct you to smash the tough outer pieces of the lemongrass stalk with a rolling pin or the side of a knife. This releases their aromatic oils before adding them to soups and curries. I only do that if the recipe specifically says to. I use a label maker for many things in the kitchen. It gives me the information I want right when I need it. I generally take the frozen lemongrass out of the freezer when I begin my recipe. As it sits for ten or fifteen minutes I can fairly easily break off the amount I need with a spoon or knife. Once you know how to use frozen lemongrass just use this amount as a guide and adjust the amount you use to suit your own taste. So now you know how to use lemongrass I hope you’ll try one of these recipes. Let me know in the comments below how it went.